Every year for at least ten (to judge by the date on one dusty jar that I can’t bring myself either to open or to throw away), I make and can salsa and sauce with tomatoes from our garden. Every year, I have to remember how all over again. Same goes for buying school supplies and baking birthday cakes and filling out tax forms—all the seasonal skills that my brain buries deep in long-term storage. I mean, I have the recipes. It’s the timing and the rhythm I lose. Although their sheer quantity and inexorable ripening may appear aggressive—even hostile—your tomatoes are not your enemy. Remember the years when, due to blight, you had to buy tomatoes at Indian Ladder Farms, beg heirloom beauties from a kindly green-thumbed librarian, scrounge the culled crops at the Co-op. Remember the year you ran out of pasta sauce. Everything in your kitchen is about to get wet. Move the damn library books. Your children and your husband will continue to regard the kitchen as a place in which to locate snacks and meals. This is a perfectly normal misapprehension, which should be corrected gently, if possible. Even things that are taking forever to cook will eventually burn. Yes, you’ve done the math, and no, canning your own sauce and salsa does not make actual economical sense, especially if you factor in your billable hourly wage. Or the minimum wage. Speaking of which, it’s OK to send your husband to Subway, where they put pale pink sliced “tomato” on your children’s subs, so that you can stay home and wrestle with 100 pounds of true tomatoes. I’m not sure why, but it is. Jars of sauce should be left on the counter “to cool” until your backache subsides or until your next dinner guests notice them, whichever comes second. If you think you smell something burning, you’re right. 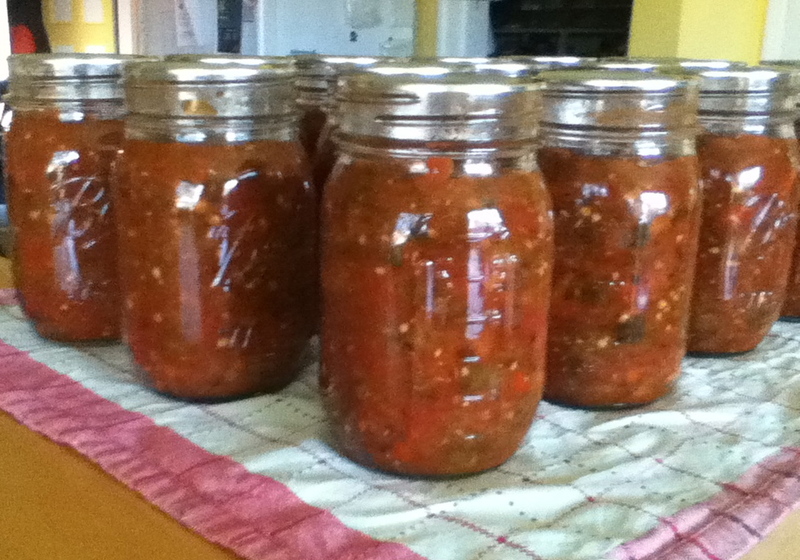 If you’d like to try canning your own salsa, you can find the recipe here. Feel free to call my red phone for advice, but do it soon: birthday cake season is fast approaching.